A new ecoomic model maps where the presidential candidates’ plans help and hurt voters—the results may surprise you. According to a new analysis of tax and census data, Mitt Romney’s economic plan is heavily tilted towards big cities, but tough on the rural areas that comprise the GOP’s base. Barack Obama’s economic proposals lean the other way, offering little to wealthy urbanites, while delivering broad tax savings to the middle- and lower-class Americans spread across the South and Midwest. The findings, released Thursday by a start-up called Politify, present a novel way to view the diverging economic promises in this recession election. In a race dominated by the rhetoric of deficits and the 99 percent, Politify says it offers unassailable data and objective answers for voters wondering how the candidates’ plans will affect their wallet, their neighborhood, or the whole country. The map clearly shows that Obama’s proposals benefit a larger portion of the electorate, but the visual effect is exaggerated, since the map is not weighted for population density. Inquiring voters can also zoom in on any neighborhood for more detailed snapshots. Take the Upper West Side of Manhattan, where the median price of a home is $1.3 million. There, 73 percent of residents do better under Romney’s plan than Obama’s. The same goes for liberal enclaves in San Francisco: in one tony area on the Bay, 67 percent of residents would take home more under President Romney. Ohio remains a key swing state, of course, precisely because it is not reliable Obama country. Bier believes that could change if his model goes viral. Then again, Democrats have spent years asking people to stop “voting against their interests.” In the canonical 2004 book, What’s the Matter with Kansas, journalist Thomas Frank cataloged how Republicans convinced a generation of working-class voters to ignore their material interests in favor of “vague cultural grievances.” Through this “backlash culture,” Frank explains, the GOP campaigned on social issues but governed on “pro-business economics” once in office. Could maps or data really change that dynamic for a digitally connected electorate? Still, Frank found the national visualization “remarkable,” given its “inversion of the old Red State/Blue State maps of the last decade—apparently showing that people are voting almost entirely against their economic interests.” And while conservatives living in “an electronic world of their own” can brush off the analysis, Frank said the data could prove useful to reporters and open-minded voters alike. At their core, however, most presidential campaigns at least aspire to an aspirational message, not pure self-interest. One additional issue for the model, which conservatives are sure to stress if this approach gets attention, is its crabbed view of economic benefits. 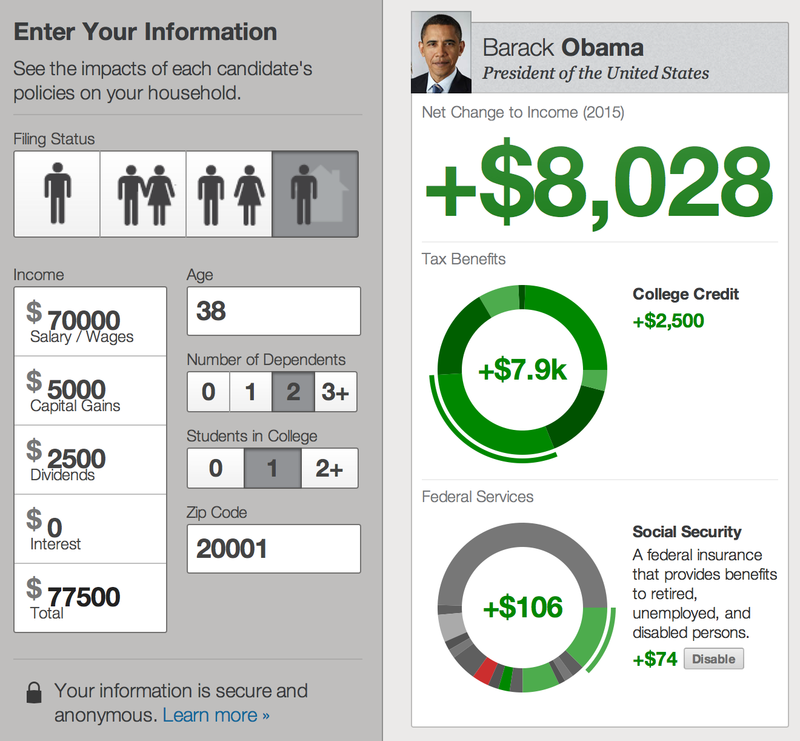 Politify offers a static breakdown of taxes and government benefits frozen in time—without any modeling of potential economic improvement under the Romney plan. Still, in a season of grand claims about taxes, entitlements, deficits and the largest downturn since the Great Depression, Politify is counting a lot, and inviting voters to inspect the results. It’s a start.